The Camelot Collection of hand scraped hardwood flooring from Pennington Hardwoods is receiving attention across the country from trendsetters in architecture and design. 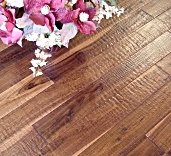 With initial projects including estate homes, theme restaurants, timber frame lodges and others, the unique characteristics of this flooring has a broad appeal. The labor of the craftsmen is visible in every contour of the wood as they transform each floor into a treasured heirloom with a century old heritage. The rich hues and burnished patinas reflecting from the sculpted expanse invokes feelings of history and beauty more commonly associated with art than flooring. With old world charm and a distinctly upscale appearance the Camelot Collection of hand scraped hardwood flooring compliments any setting.